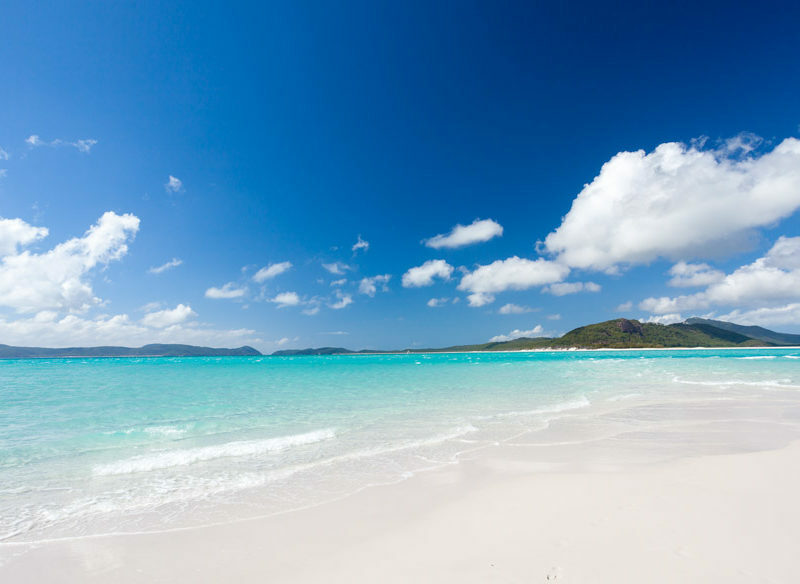 Whitehaven Beach: perhaps the best in the world? “We’ve run out of coffee,” the dreaded words ring through our catamaran. How six people could consume an entire jar of Nescafé in one day, I don’t know, but there are more pressing things to worry about. Namely, where will we find more? “I’ll just go and ask the neighbour,” my friend jumps into a kayak, which is bobbing behind the boat where we’ve woken up, just offshore from arguably Australia’s most beautiful stretch of sand – Whitehaven Beach. Kayaking around the Whitsunday’s floating community (photo: Celeste Mitchell). We laugh and watch in anticipation as she paddles over to the yacht anchored nearest and a salty captain wearing nothing but black Speedos and small thick-lens glasses leans over to greet her. This friend could charm her way into anything, so I’m not surprised when she returns victorious, bag of grind raised above her head. As we sip our morning coffee and eat bacon and eggs on the back deck, it feels like we’re part of some exclusive club – here on an invite-only, VIP sleep-over made possible by our on-loan luxury catamaran. The tour boats won’t arrive for another hour or so. There are four yachts in front of us and six more behind us, which sounds crowded, but with seven kilometres of beach to share, the patch-of-sand-to-people-ratio works out nicely. We bob gently in the cool morning breeze – all facing the same direction, all locked in a stationary race. The protected waters of the Whitsunday Islands are made for novice sailors like us and with weather conditions like today (10–15-knot winds, one-metre swell, mostly sunny), we know we won’t need those ginger tablets. Of course, just two days ago, 10–15 knots sounded like a foreign nautical language for which I had no translation app. Besides one term of navigation during marine studies at high school, the closest I’ve come to plotting a course on a yacht is to direct the waiter my way for a top-up of Champagne. It’s a breeze: Sailing through the Whitsundays under your own steam (photo: Celeste Mitchell). But sailing the Whitsundays had been on the bucket list for all of us for years, and with the cost working out to be less than we expected, we packed our pirate garb, chartered a 38-footer called Sirocco, and put ourselves in the hands of expert skipper Mike Dicker from Go Bareboating to show us the ropes. A collective of five accredited charter boat companies operating out of Airlie Beach, Go Bareboating offers over 140 vessels for hire and specialises in helping newbies find their sea legs. The waters of the Whitsundays’ 74 islands are regarded as the safest cruising area in the southern hemisphere – which is what attracts 15,000 charterers each year – and surprisingly, you don’t even need a boat licence. We spend a morning being put through our paces in the classroom and then out on the water – the sails go up and down twice, tacks are done with ease. Taking the helm of Sirocco (photo: Celeste Mitchell). “This is a good opportunity to get to know your boat without too many things to worry about,” Mike says, leaving only when we’re completely comfortable, we’ve been through all the safety procedures, and have been briefed on the ‘squeeze and flush’ toilet technique (yep, it’s as it sounds, and no, you don’t want to be the one to block it). It’s amazing how confident we feel after this sailing certification on steroids. We’ve mapped out our route; we know exactly how to make our way to Nara Inlet, where we plan to anchor up. We aim for the northern hump of South Molle Island and once we edge close enough, we tack and angle alongside Daydream Island. The tension in my shoulders begins to release as I loosen my tight grip on the wide steering wheel; someone switches on the tunes. Once we reach the leading lights (new boating terminology, tick! ), we turn right to make our way through Unsafe Passage – a thoroughly deceptive name, as Mike assures us we’ll be fine. Now picking up enough speed, we kill the motors and look up at the puffed-up mainsail proudly pushing us forward. We’re sailing! For the next hour we sail at seven knots towards the mouth of Nara Inlet as the afternoon sun dances across the ocean and we watch the silhouettes of other yachts making their pilgrimage towards the same anchorage. Shrouded in Nara’s protection from the wind, we use our newfound skills to calculate the length of anchor chain needed and within a few minutes, we’re secured in our floating hotel for the night. Diving straight off the boat into Nara’s turquoise embrace and sipping beers on the deck as stars ignite, I think it’s safe to say we’ve been inaugurated into the sailing fan club for life. Hire your own ‘floating hotel’ in the Whitsundays (photo: Celeste Mitchell). The next three days are run by the sun’s arc in the sky instead of the hands on a watch. With no schedules to meet, and no regimented itinerary to keep, time bends into a new type of reality. The depth of each day seems endless with possibility. We do have a couple of responsibilities, however, but these are as simple as a reassuring radio call every morning and afternoon back to the Go Bareboating crew, and a promise to be anchored up by 4pm each day. It’s too early in the season to spot whales, but when we take the dinghy for a spin, sea turtles pop their heads up with a short, sharp gasp for breath all around us. We pull the tender up on shore and hike to see rock art, and marvel at the towering landscape and windswept bushland of Whitsunday Island as sea eagles float overhead. Bareboating territory: Take on the channels of the Whitsundays with your own catamaran. The beauty of our DIY adventure is that we manage to avoid any crowds. We snorkel with playful batfish and over giant coral bommies in Blue Pearl Bay with not another soul in sight, and drink in Hill Inlet’s marbled beauty all to ourselves, where the water is so transparent we see stingrays shimmying across the sand. The boys attempt to catch dinner each day but luckily we’ve got enough provisions on board to feed a small army. And nothing tastes better on a boat than a cheese platter and a glass of bubbles at sunset, anyway. After four days as a salty sea dog I’ve realised that bareboating isn’t like learning to ride a bike or getting your learner’s permit; it’s better. With my hands gripping the helm, I feel like I could conquer the world. Watch out Matthew Flinders, make way Captain Cook, I’ve got myself a catamaran and I’m not afraid to use it. The Whitsundays has over 300 days of sun every year, so the going’s pretty good year round – winter temperatures (June, July and August) are around 20-25 degrees; summer is around 30 degrees. Ideal periods to visit fall between March and May, and again between August and December. Most rain falls over January and March, but even then tropical showers rarely last longer than an hour or two. If you’re a keen sailor looking for a nautical spectacle, Airlie Beach Race Week and Hamilton Island Audi Race Week are held annually each year in August. Do I need a boat licence to go bareboating? – Test the waters with a day sail adventure aboard the striking purple catamaran, Camira, with plenty of time to swim, snorkel and relax at Whitehaven Beach. – Visit uninhabited Langford Island and Bali Hai during a full day on traditional tallship, Derwent Hunter. – Take a two-day, two-night sail with a small group of around 10-12 people with ISail Whitsundays, with accommodation ranging from dorm-style to private rooms with en-suite. – Add an overnight sail guide to your charter with Go Bareboating; and a hostess/cook if you’re really looking for a hands-off holiday! Getting there: Fly into either Whitsunday Coast Airport near Proserpine or Hamilton Island Airport. There are direct flights from Brisbane, Cairns, Sydney and Melbourne. Playing there: Stinger suits are provided free of charge while snorkelling equipment, kayaks, fishing gear and stand-up paddle boards can also be hired. Eating there: Whitsunday Provisioning saves you the supermarket whip-around by delivering everything you could possibly need straight to your boat, ready for your departure.